The first is that meteors or comets transported water like a cargo carrier to form ocean basins. And the second theory is that water came from inside the rocks that made up the Earth itself. Very likely, both theories contributed to the Earth’s oceans. But the amounts of each is debatable. So where did the 326 million trillion gallons of water on Earth come from? Was it comets or volcanoes? Turns out, there’s a good case for both. If you look at surface area on Earth, water covers about 71% of the planet. Some is salt water and some is freshwater. But if you look at Earth’s mass including its interior, water accounts for only 0.02% of the planet’s mass. Because water is very abundant in space, comets needed to transport only 0.02% of this mass to Earth. This makes water from comets a plausible theory if you simply look at things from a ratio of mass. But not all water is alike. Deuterium or “heavy water” is an isotope of water. For every 10,000 water molecules on Earth, there are 3 deuterium atoms. From studying comets, these dirty snowballs show a higher ratio of deuterium. 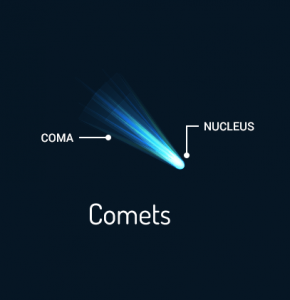 Because there’s a higher concentration of deuterium in comets, it makes theory less likely. However, analysis from the Rosetta Comet shows a higher ratio of deuterium. it’s less likely that comets transported water as cargo to Earth. The simplest explanation is often the best. It’s the theory that water existed inside the rocks that made up the Earth itself. 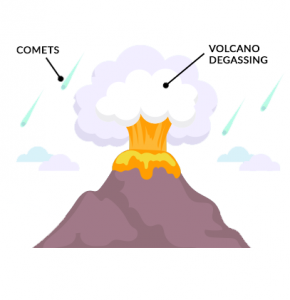 Because Earth’s interior contains minerals with hydrogen and oxygen, volcanoes continual ‘degassed’ or ‘outgassing’ releasing H2O as water vapor. 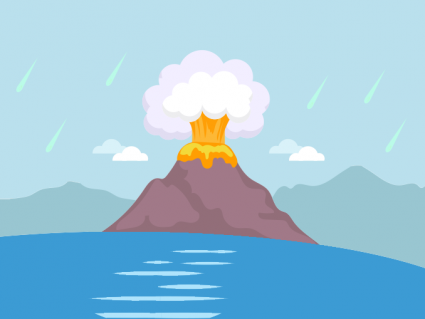 During Earth’s early history, magma flowed from the mantle to the crust from tectonic activity. Heat flow was nearly 3 times as high as it is today. Because of the intense heat, water would have evaporated into space. But Earth’s surrounding atmosphere gradually cooled down. Earth’s surface cooled below the boiling point of water. Instead of water evaporating into space, rain began draining into ocean basins. Earth wasn’t always the big, blue marble that we know today. About 4 billion years ago in the Hadean Eon, it was a hellish place. Heat flow was intense. Because of the high temperatures, any water on the planet would have evaporated into space. Whether water came from comets or volcanoes, Earth’s cooling was necessary. And it was over millions of years this process continued. Theorize exist how the Earth cooled. After Earth’s climate stabilized, water no longer evaporated. Finally, water condensed, formed oceans and remained. And because Earth had oceans, this is where life could begin. Eventually, evolution began to the last universal common ancestor called LUCA.